Microsoft has started rolling out more details about Office 2011, the upcoming upgrade of its productivity suite. On Wednesday, the company posted a brief video on its Mac Mojo blog showing off a few of the suite’s new features. The video-which combines images of the software and interviews with Microsoft developers-highlights three main features: The revamped database and threaded Conversation view in Outlook (which will replace Entourage as Office’s e-mail client); and a new template gallery. Microsoft reps say that the database underlying Entourage 2008-which stored your e-mail messages, calendar entries, and contacts in one huge file-was a “pain point” for customers. Among the reasons for the pain: If you made the tiniest change to that database file-by receiving an e-mail message, say, or adding a new phone number-then Time Machine would think it had to back up the whole thing. 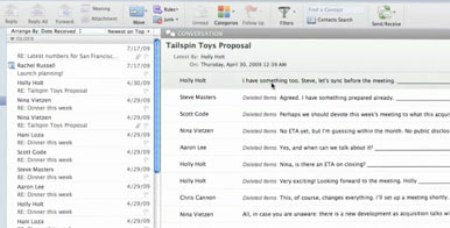 In the video, the company sings the virtues of Outlook 2011’s new database structure, in which messages, appointments, and contacts will be contained in discrete files. That should make for smaller and faster backups; it should also make it easier to find Outlook items with Spotlight. Instead of showing you low-res thumbnails of templates and themes, the new gallery gives you rich, high-def previews. If a template has multiple pages (the first page might be formatted one way, subsequent pages another), you can preview all of them before you start work. You can also customize the template’s color scheme and font; in PowerPoint, you can set the orientation (Landscape or Portrait). The template gallery also includes a link to Microsoft’s online template library (which the company says contains thousands of templates, from professional designers as well as regular Office users). The searchable gallery is organized by categories ans sports a recent documents list, with links to documents you’ve worked on today, yesterday, or in the past week or month. Finally, the video offers a glimpse of the previously announced Ribbon, which replaces Office 2008’s Elements Gallery. Like that gallery, the ribbon provides quick access to commonly used tools. Unlike that gallery, you can completely collapse the Ribbon, to reclaim screen space.